The Star Wars saga involves countless characters in minor and major roles that come and go throughout the story. But two characters have followed the story from the beginning of the Skywalker family. These two characters are the Droids, C-3PO and R2-D2. From humble beginnings, they became members of the Rebel Alliance and took part in some of the most important events of the Galactic Civil War. Now, you can bring these iconic Droids to your games of Imperial Assault with the R2-D2 and C-3PO Ally Pack. 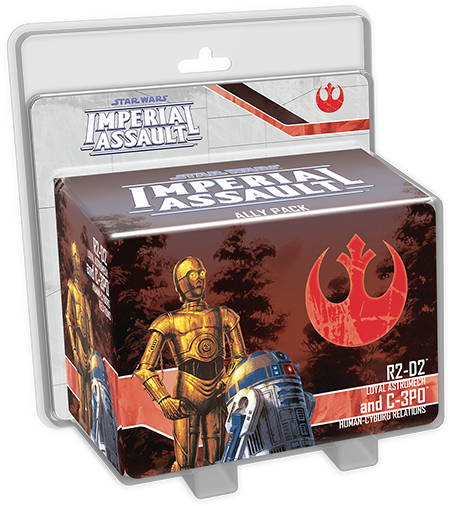 Like other Ally Packs, the R2-D2 and C-3PO Ally Pack offers far more than two sculpted plastic figures to replace the tokens included in the Twin Shadows expansion. Here, you’ll find the Deployment cards to play R2-D2 and C-3PO in your campaigns and skirmishes, as well as a new campaign side mission and two new skirmish missions that share the same map. What’s more, you also receive five new Command cards to maximize your Droids’ potential in any skirmish game! Today, we’ll join these two beloved Droids and explore how they can aid the Rebel Alliance in your games of Imperial Assault! Throughout the Star Wars series, C-3PO and R2-D2 have walked alongside heroes like Luke Skywalker, Leia Organa, and Han Solo. Though they may not fight with Lightsabers or use the Force, these Droids have played crucial roles in the story. R2-D2’s technical knowledge has gotten his friends out of tough spots, and C-3PO proved the value of etiquette in Jabba’s Palace and on the forest moon of Endor. C-3PO and R2-D2 can offer similar support to your heroes in your games of Imperial Assault. Whether you’re playing a campaign or a skirmish, C-3PO can use his knowledge of galactic protocol to keep your fighters alive. C-3PO can spend an action to use his Inform ability and Focus an adjacent figure, giving your warrior the information he needs to make his next attack count. As figures like Gideon Argus have demonstrated, reliable ways to Focus your fighters can be highly profitable. Added Focus isn’t the only benefit C-3PO offers, though. While a friendly figure adjacent to C-3PO is defending, C-3PO’s Distracting ability adds an automatic evade, potentially making incoming attacks much less dangerous. 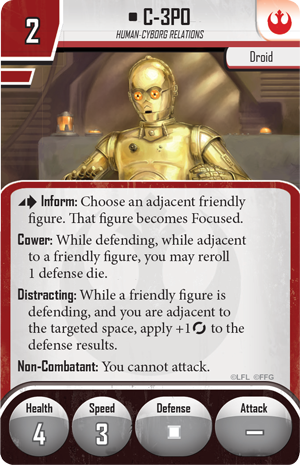 In light of these benefits, your opponent may choose to destroy C-3PO at the earliest opportunity, but C-3PO’s Cower ability can help him stay alive. While C-3PO is adjacent to a friendly figure, he may reroll a defense die, giving him a much better chance of completely dodging the attack. Finally, C-3PO himself is a Non-Combatant, meaning that he cannot attack. That said, the benefits he provides to your other fighters are too significant to overlook. Even if C-3PO prefers to refrain from combat, R2-D2 is under no such compulsions. R2-D2 rolls only a single yellow attack die, but he offers a host of surge abilities. R2-D2 receives a constant bonus of two additional accuracy and one free surge for every attack, and he can spend a surge to pierce enemy armor, Stun an enemy figure, or inflict the new Weakened condition to reduce your opponent’s surges and evades. Although he can fight on your behalf, R2-D2’s greatest applications exist outside of combat. R2-D2 can keep your mechanical units in fighting shape by using his Service ability to heal a damage from himself or an adjacent Droid or Vehicle. 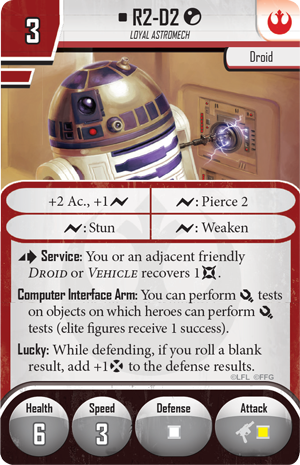 R2-D2 also bears the Lucky ability, which dramatically increases his survivability by granting a bonus dodge result whenever he rolls a blank result on a defense die. Since R2-D2 rolls the white defense die, two of the six possible die results allow him to dodge all damage! R2-D2 is also unique in that he is the first figure to have two separate Deployment cards: one for the campaign game and one for the skirmish game . These Deployment cards are identical in every way except for a single ability. In a campaign, R2-D2 can help your heroes complete their objectives with his Computer Interface Arm. This ability allows R2-D2 to perform Tech tests wherever a hero could. Because R2-D2 is an elite figure, he automatically receives one success to any test that he attempts. If your hero party lacks a dedicated technician, R2-D2 can help you slice past whatever may stand in your way. In a skirmish game, R2-D2 loses his Computer Interface Arm ability, but he gains the Scomp Link ability. 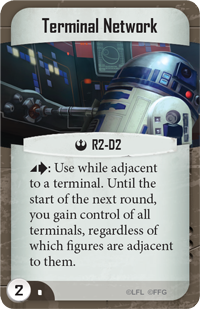 While R2-D2 is adjacent to a terminal, he may spend an action to use Scomp Link, which allows you to immediately draw a Command card! Command cards are crucial for surprising your opponent and gaining the upper hand in a skirmish. Any time you can draw more Command cards, you have a better chance of turning the tables against your opponent. 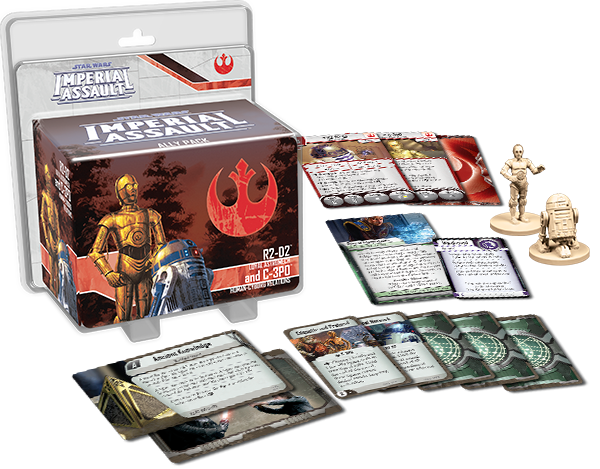 On the subject on Command cards, the R2-D2 and C-3PO Ally Pack comes with five new Command cards to support your units in skirmish games. Two of these Command cards can be played on any figure in your army. Hard to Hit allows one of your figures to reroll one of its defense die, which can make the difference between a defeated figure and a figure ready to attack on your next activation. The second Command card included in this Ally Pack is Single Purpose . When you play Single Purpose at the start of an activation, you may use the same special action up to twice during your activation. 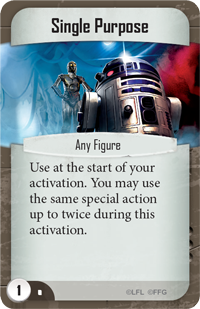 Obviously, this card can allow C-3PO to Focus more figures or let you draw more Command cards with R2-D2’s Scomp Link, but Single Purpose can also expand the abilities of any number of other figures. 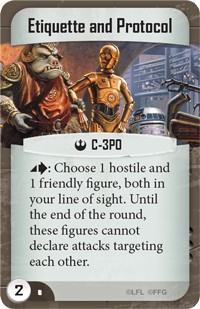 This Ally Pack also includes two unique Command cards that can only be played on R2-D2 and C-3PO. R2-D2 gains the Terminal Network Command card, which you can play while R2-D2 is adjacent to a terminal. Until the start of the next round, you gain control of all terminals on the map! Not only does Terminal Network bring you more Command cards, it prevents your opponent from drawing more than the bare minimum on his next turn. C-3PO also gains a powerful Command card in Etiquette and Protocol . As an action, you can play Etiquette and Protocol to choose a hostile figure and a friendly figure in your line of sight. Until the end of the round, these figures cannot attack each other. Even if Darth Vader is bearing down on a lowly Rebel Trooper, you can ensure that the Trooper lives for at least another round. Etiquette and Protocol can be especially useful when you’re racing to carry an objective to a specific location. 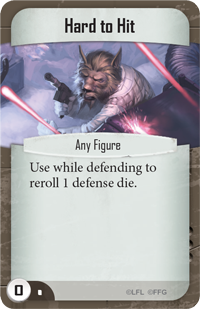 Command cards that are specific to a certain figure are among the most powerful Command cards in the game, but they do you no good if you can’t find them when you need them. Now, you have a way to search your deck for these cards by playing Devotion . 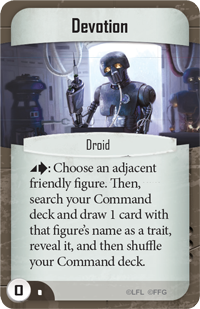 Devotion allows one of your Droids to spend an action to search your Command deck for a Command card that corresponds to an adjacent figure, helping you find just the right card for the situation. Devotion is just another way that C-3PO and R2-D2 can help the heroes of the Rebellion! C-3PO and R2-D2 have had countless adventures together on planets across the galaxy. Now, you can bring these Droids on new adventures in your Imperial Assault missions. Pre-order your copy of the R2-D2 and C-3PO Ally Pack at your local retailer today!